F.A. Trophy Record, to 1990. 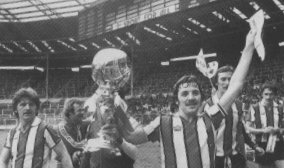 Graham Heathcote leads the Trophy celebrations at Wembley, 1978. For Trophy results from 1990 onwards, click here.